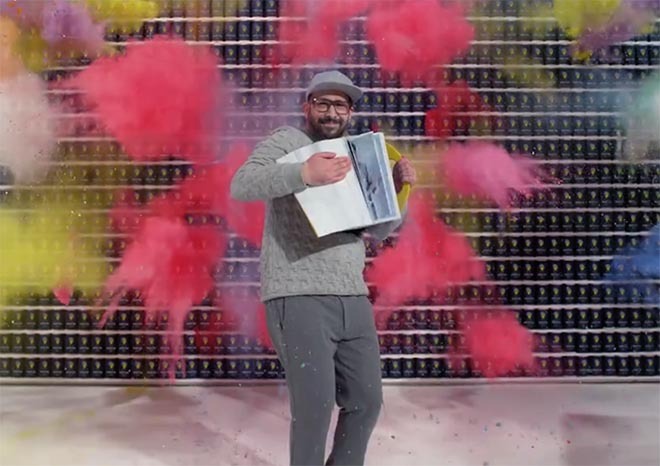 OK Go has partnered with Morton Salt, a salt products company, to release a music video for “The One Moment”. 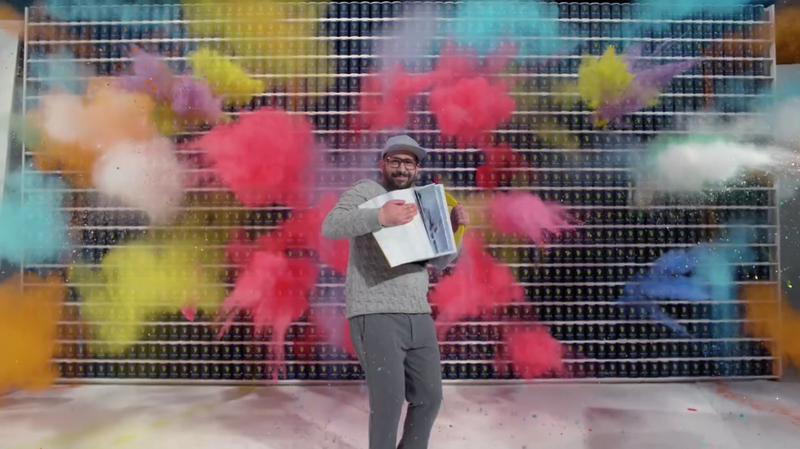 The OK Go The One Moment music video explores the slow-motion rendition of a sequence filmed in 4.2 seconds. Seven cameras powered by high speed robotic arms capture 318 events, including colored salt bursts, exploding paint buckets, gold water balloons, water melons, spray paint cans, and Fender acoustic guitars. The music video was commissioned by Morton Salt as part Walk Her Walk, a campaign to support a group of people who are bravely making a positive difference in the world. Morton Salt has pledged funding and assistance to inspiring and effective young innovators who are tackling difficult issues like the global water crisis, the plight of young female refugees, systemic failures in arts and music education, and children’s health and wellness education. The five innovators are Michelle Edgar, founder of Music Unites, Blair Brettschneider, founder of Girl Forward, Haile Thomas, founder of Happy Organisation, Adarsh Alphons, founder of Project Art, Seth Maxwell, founder of Thirst Project. The #WalkHerWalk slogan is a reference to the girl in the Morton Salts logo. See more on the WalkHerTalk campaign at MortonSalt.com/WalkHerWalk. “The One Moment” track is from the 2014 OK Go album Hungry Ghosts. The song “The One Moment” is a celebration of (and a prayer for) those moments in life when we are most alive. Humans are not equipped to understand our own temporariness; It will never stop being deeply beautiful, deeply confusing, and deeply sad that our lives and our world are so fleeting. We have only these few moments. Luckily, among them there are a few that really matter, and it’s our job to find them. (We had no idea when we wrote the song that we’d be releasing its video in such critical moment for our nation and the world. It’s one of those moments when everything changes, whether we like it or not, so the song feels particularly relevant). For the video, we tried to represent this idea literally — we shot it in a single moment. We constructed a moment of total chaos and confusion, and then unraveled that moment, discovering the beauty, wonder, and structure within. Most of our videos have sought to deliver wonder and surprise, and this one is no exception. But usually our tone has been more buoyant, more exuberant. For this song — our most heartfelt and sincere — we wanted the sense of wonder to be more intimate and contemplative. Having said that, there is still a huge amount of paint slung around. I guess you can take the band out of…..
OK Go members are Damian Kulash, Timothy Nordwind, Andy Ross and Dan Konopka. Creative work was done at Ogilvy Chicago by chief creative officer Joe Sciarrotta, executive creative director David Hernandez, creative director Amy Gozalka, associate creative director Kara Coyle, executive producer Gayle McCormick, senior producer Annie Larimer, project manager Philip Puleo, management supervisor Paige Robinson, and assistant account executive Katie Quinn, working with Morton director of communications and corporate brand strategy Denise Lauer, senior communications manager Paul Jackiewicz, head of sales and marketing Shayn Wallace and senior director of brand marketing Peter Sashin. Filming was shot by director Damian Kulash via Park Pictures with director of photography Shawn Kim, executive producers Justin Pollock and Jackie Kelman Bisbee, producer Pat Frazier, production designer Bradley Thordarson, executive brainstormer Elan Lee, first assistant camera Chris Slany, second assistant camera Matt Sumney, Phantom tech Patrick McGraw, behind the scenes director Ross Harris, stills photographer Daniel Goldwasser, Bolt programmer Simon Wakley, Bolt assistants Chris Toth, Leo Roberts, gaffer David “Blue” Thompson, best boy Randy Dye, electric team Jeff Matthews, Adan Galindo, Shaun Stallard, Louie Manzo, art director Steve Christenson, art coordinator Katy Shirey, set decorator Tally Duke Floyd, leadman Lance Rosa, set dressers Andre Price, Kevin Quinn, Silvio Scillone, Tony Alvarez, prop master Ben Ferene, prop assistant Mark White, lead painter Jamie McElrath, painter Molly Holnick, production supervisor Ari Chang, second assistant director Ricky Weaver, assistant production supervisor Amanda Andrews, scriptwriter Kristy Kelly, VTR operator Tom Myrick, craft services director Michael Backlinder, production assistants Brian Lierk, David Rada, Robert Lomeli, Oscar Matute, Chris Maltauro, Morgan Pham, Melanie Cycz, make up artist Kristen Shaw, wardrobe stylist Christina Blackaller, and assistant stylist Laurel Rose. Special effects were produced through Beyond L.A. Productions by SPFX supervisor Kelly Kirby, foremen Robert Garrigus, Doug Calli, Tech team Steve Shines, Bill McGinley and Rich Jacobs, and set dresser Aaron Ferene. Editor was Cass Vanini at Work Post with assistant editor Ben Foushee and producer Sari Resnick. Visual effects were produced at Artjail by VFX supervisor/creative director Steve Mottershead, head of production John Skeffington, VFX producer Adriana Wong, compositors Chris Memoli, John Geehreng, Ben Vaccaro, Elsa Tu, Sam Caine, Brian Benson, Dayung Jo, Eric Concepcion, Chris Russo, Sohee Sohn, previz Darren Chang, titles artist Ryan Hawthorne and colorist Shawn King.